Indra: You guys are known for being across all genres with your music and not only just collaborating with a lot of other artists, but pushing the boundaries of what Jazz music is. I was wondering if you could talk a little bit about how you guys arrived at the sound that you have now. Shane: Well, I think we always had a focus, not even one we talked about explicitly but just naturally as musicians we were kind of interested in different types of music and when we were playing I think we were interested in doing something that felt original and unique. So it’s just been kind of a guiding principle for us and I think the natural assimilation of all the music we listened to. Actually, the members of the band come from different backgrounds; like I grew up in a very musical household but my parents were classical musicians and then I got really into traditional jazz in high school and that's sort of my foundation. Our keyboard player, Adam, was really into prog rock and stuff like that. Our drummer Nate was really into death metal at a certain point but his parents were both musicians in the folk rock world, like his father was the musical director for Kenny Loggins for a year, so he had this California folk rock thing in his house. Ben Wendel, the saxophone player also came from a classical music background, like his mother is an opera singer and he was really into Strauss and Tchaikovsky at a certain point and then got into traditional jazz. Kaveh: Yeah, my background was pretty varied. [We had a] big record collection at home. My parents weren't musicians. My mom was involved with a man who's kind of like my step-dad and he's a musician. His name is Mike Johnson and he has a band called Thinking Plague, which is based in Colorado and their music I think is played on KGNU. Its really intense hard rock kind of music and then I just grew up listening to everything from Punk Rock and Hip-Hop to R&B and Reggae. Indra: You guys are both from Denver, so Dazzle is relatively new in the scene here. What was it like growing up here in jazz? Were there any places you could go to see live jazz when you were younger? Shane: Yes, I have real fond memories of that. I used to always go to El Chapultepec, and It was always usually the same of Denver's finest players. There was like Paul Romaine and Eric Gunneson, Kenny Walker and Billy Tolls - rest in peace Billy Tolls. So, that was my main stop there. In Denver, now that I've moved back, there’s a lot of jam sessions, a lot of clubs with jam sessions. If you're a young player, there’s like 7 different places you can go during the week to just sit in and play. When we were growing up, Kaveh and I, there were one or two and then they would last a little while and then go away. So, I would just go stand on the side of El Chapultepec and wait for those guys to give me a chance to play with them. I would go find people that were great here like Ron Miles was like a mentor and an important person for both of us as is Arden Landey who lives up here in Boulder. There was definitely resources, we just had to go out and find them. Kaveh: I thought that Denver was an amazing city and it was a really unique time to be a teenager here in the early '90's. The first show I ever played was sold out at the Mercury Cafe for 350 kids stage diving off the stage. There was a band called the Psychedelic Zombies. They were an amazing band and they are all dear friends of mine. They're all making music today and people I work with all the time. I just put out a record about a month ago, my own record, called Light of Love that features a lot of those guys, the Denver friends. It's an amazing city. I've had the opportunity to work in different countries. I worked in Italy for 6 years and saw the lack of opportunities for even established musicians to develop their own projects without having to just play in cover bands and having to play after a DJ. I felt really lucky growing up in Denver where you could hear people like Kenny Walker. You could hear world class musicians that live here in Colorado and then also, as a teenager, you could play at any number of cafes. I would play at the Gothic Theater - I played at the Ogden Theater, the Blue Ridge Theater, the Mercury Cafe as a teenager. Indra: That's really amazing in a perspective that people don't really think of a lot. Shane: I hope people don't take it for granted, because it's not like that in other cities in the states, and it’s definitely not like that in other countries where people really want to have a place to play and you really have it here in Denver. Indra: Let's talk about your latest album Anti-Hero which came out last year. I think I read somewhere that it is kind of a response to some of the political situation that’s been going on, so I was wondering if you could say a little bit more about that and maybe a couple of the songs that we could feature here today for our listeners. Shane: Sure, some of that music is definitely a response to what's going on now. It’s affecting everybody, so everyone's having a reaction. For us, it’s definitely some music thats coming out that addresses that. The first song on the album is called "For The Fallen," which is just for anyone who has lost their life in war; be it a soldier, or a victim as a citizen. There is song we play a lot called "Uprising," and we usually take that song as a chance to talk about some of our thoughts about the situation. So much of what is happening right now is pretty frustrating, gross and depressing. But the message we put out about it is to keep focused on making things better and turning things around, becoming better as people, becoming better at connecting with each other and sticking to the things that are really important in order to become a better society. We are fair and just, and there’s human rights and civil rights and human dignity and respect straight across the board, and to not get sucked into this nasty game that’s getting played now where everything is vicious personal attacks and fought with corruption and fraud. The song is about rising up above this current climate. Kaveh: The other song I want to talk about today is a song that I wrote on the album. The cool thing about Kneebody is everybody brings in their own music and everybody has their own unique compositional voice. You can really get a good feel for everyone's writing. I wrote two songs for Anti-Hero and they're both dedicated to dear friends who've passed away. One song was dedicated to the brilliant, young pianist Austin Peralta who passed away way too young. The other song is dedicated to my oldest friends - his name is Mikey Lee and he and I grew up playing music together. We met in high school and he showed me around a bass and a guitar and we remained friends until his death three years ago, and I actually produced his very last record that came out about a month before he passed. The song is dedicated to him and his memory, but I like to talk about how its been really wonderful and therapeutic to mourn his passing through the song and get to do it with these friends and this band and being able to say his name during performances. Indra: It seems like some artists are putting out two albums a year and some are waiting between 4 and 5 years to put out albums. What's going on with you guys? Do you have any other projects in the works? Kaveh: Over the last six months we've been collaborating with different singers and different instrumentalists, kind of putting out this Kneebody cover project that has been a lot of fun to work on. We’re arranging and performing and recording songs by a diverse array of artists with other artists. In addition to that, we are also recording and producing new music with these artists too. Shane: So far we've done a few- not all of them have been released yet, but the things that are out on video are a cover of the song "Work" by Rihanna, a song from Beck's last album called "Dear Life," and the one we wanted to play a bit today was from John Legend, Kaveh has been John Legend’s bass player for the last couple years and plays with all of those great musicians and he suggested this song. We featured our friend Gerald Clayton, the great pianist, who I think is coming through Colorado soon with John Scofield. He's fantastic. Kaveh: The song is called "Hold on Longer" and it's from an album that John put out a couple albums ago, "Love in The Future.” "Hold on Longer" is one of the sleepers, but it’s a band favorite. Everybody in the band loves the song, it's a gorgeous tune. It was really fun to bring it to Kneebody and I'm really excited about this version. John really loves it, too. 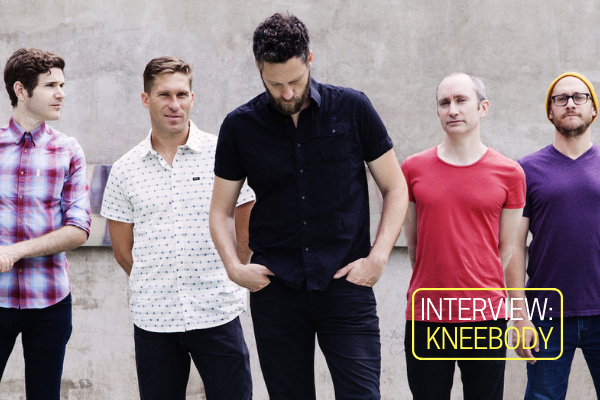 Find out more about Kneebody at kneebody.com.